#2 – consistent with the SOA (Service Oriented Architecture) principles, Google Calendar is a “loosely-coupled” service that provides very well defined interfaces. 1) Quick access. anything more then a single click will not work when you’re talking to someone on a phone and need to pull up your schedule. 2) Universal access. what good is a calendar that doesn’t have the latest information every time I look at it? Google Calendar has some more notable and interesting features, like built-in RSVPs, and ability to publish events or whole calendars easily. 2) A task list that’s tied to the appointment item, and that I can then review along-side (or outside) the calendar and that can prompt me that I have an appointment coming up tomorrow but there are still 3 things outstanding that need to be done for it. 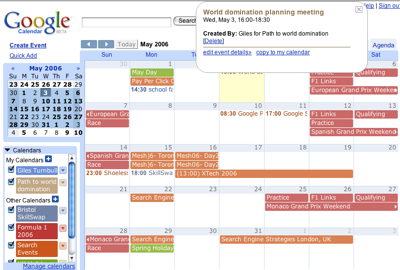 Since this blog is mainly targeted at small organizations looking to leverage the best new technology has to offer, I think Google Calendar represents a huge potential for them. Various schools and organizations can publish out their schedules without the need to call people or send out update notifications. Performance Venues can do the same by publishing and updating the schedules on the fly. Stores can publish their sales and other promotions. If you haven’t yet thought about the ways to capitalize on this technology, I strongly encourage you to do so. UPDATE: I just downloaded GoogleSync to synchronize with Blackberry, it works like a champ!